We followed 3 Austrian Land Cruisers into the customs. One of the vehicles had their back window tapped up - some children had tried to hammer their way into the car that morning, while they had stopped at outside a shop in a small village! This puts stone throwing into a new light. Immigration forms were duly filled in and eventually stamped - it was interesting to see the locals getting as much, if not more hassle than the tourists! We had not changed any money officially (indeed we required very little money for Algeria), so we had no official currency exchange receipt to compliment our currency declaration form. The implication that we had spent no money in Algeria (or exchanged currency on the black market) was not registered by the officials. The customs officer was unclear about what to do with the carnet, indeed he stamped 2 pages in error. The cursory search of the vehicle ended abruptly when the officer got his hand filthy on the sooty end of the storm kettle. At the border we met a charming Swiss couple (Jacques and Chantal) with an extremely smart Land Rover TD5 conversion (allowing them access to their rooftop sleeping quarters, a wooden-based double bed, from within the vehicle). They are frequent desert travellers, were old hands at border crossings and able to point us in the right direction on the Tunisian side. They were intending to catch the Genoa boat on Friday (the next day) and were planning on staying in Hammamet, apparently much more pleasant than Tunis and only 50km drive to the boat the following day on excellent roads. The Tunisian immigration officials were efficient but the customs had more carnet problems (they seemed to understand what should be done but no-one was interested in stamping the carnet). When we were asked for 1000 TD for a road tax/stamp we were initially shocked, as of course we had no Tunisian Dinar (you are not allowed to import or export currency). However, like so many of the previous French administrations, the decimal point requires adjustment. Jacques resolved our problem by offering us one dinar - around 50p, implying that one must move the decimal point 3 places! Again the customs inspection of Daph was curtailed by the grubby storm kettle, although the officials were struggling to comprehend our journey - obviously few overlanders cross this way! The final coup de gras came when one of the customs men tried to swap his pistol for Adrian's leatherman - time to hit the road! Tozeur lies on the edge of a large salt pan, which shimmers far off into the distance, although the unpleasant sulphur smell hangs in the air. It is quite a tourist destination, with numerous smart 'tourist' hotels ringing the southern edge of town and a large number of tourist coaches taking people to and from Tunis. We stopped in the old town to get some currency (from a visa ATM!) and local provisions. The old mosque dominates the skyline and is surrounded by market traders. One stall owner asked us if we were German, but once he found out we were English he said 'Ah, lovely jubbly' in a Del Boy accent - just shows the power of the international media and we thought we were there to get the Tunisian culture! We easily drove from the border to Tunis in one day (some 550km) as the roads were excellent tar - indeed we had a stretch of peage (2.4TD) on pristine motorway. 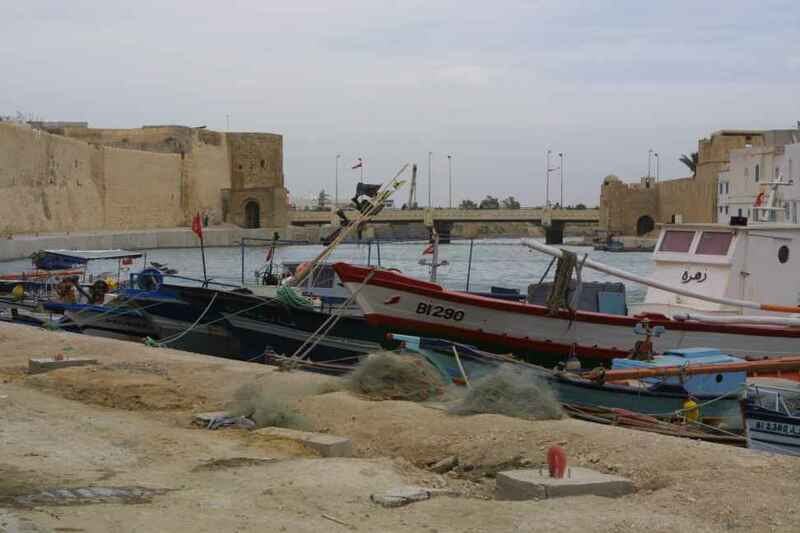 It appears many desert travellers stay at the Hotel Amilcar in Carthage, which is easy to find from the motorway and takes you past the thriving port and town of La Goulette. The Amilcar is definitely faded 60s glory, although perhaps we are being unfair as it was the quite season. There is ample safe parking, it has its own private beach and is cheap for reasonable facilities. Tunis is a town of two halves, the very smart and upmarket Ville Nouvelle area (with its smart shops, trams and traffic jams!) and the old Medina (with narrow streets and the Grande Mosque). Both have charm and are easy to explore. There is still a strong French influence here. We had to go to get a ferry ticket from the agent in town, for it was not possible to buy one at the ferry port, unless on the day of travel. We decided to take the Marseille boat (that departs every Sunday) in preference to Genoa, to give us more time in Tunisia. We also felt it would be easier to travel north on the N7 (or A7) through France. The Genoa boat leaves every Friday, is marginally cheaper and faster. There was a vast array of desert vehicles and bikes arriving for the Friday boat. The majority appeared to be German, but there were many specialist trucks and support vehicles and heavily modified dune buggies. We were surprised by the extent and popularity of desert exploration, especially when considering it is still early November and the reported troubles within the North African countries on the FCO website. Our experience runs counter to this, for 80% of the ferry traffic were European travellers, a small number of which were using the Hotel Amilcar. 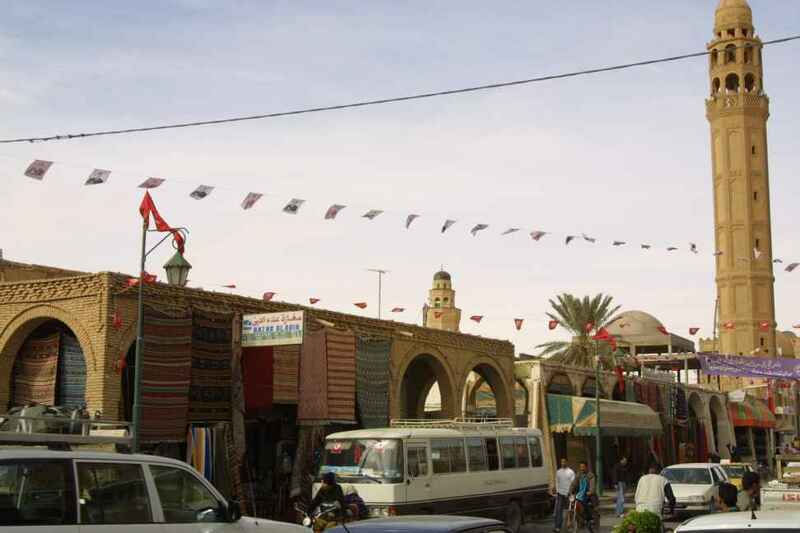 As we did not get into Egypt, our 'Cape to Cairo' trip became modified to 'Tip to Toe' travel. We had visited Cape Agulhas, the bottom of the African continent, so now we travelled to Cape Blanc, the northern most point on the continent. 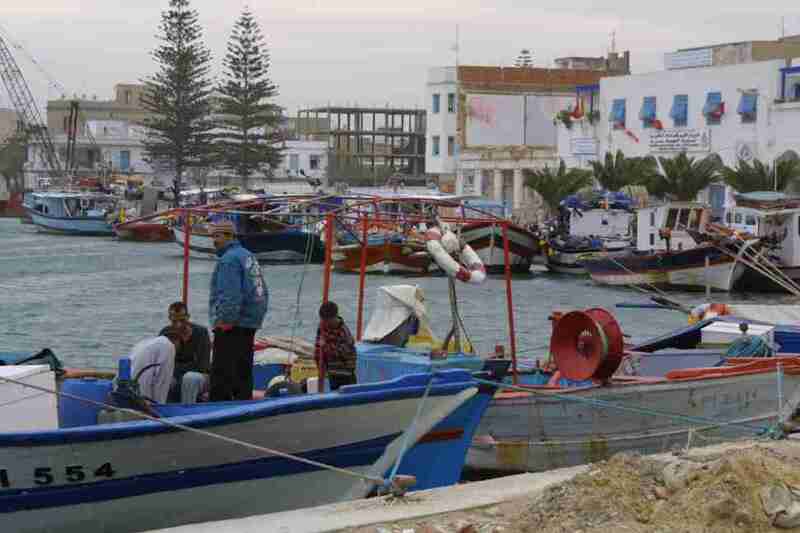 There is a peage between Tunis and Bizerte, which is reported to be a thriving upmarket retreat and port and just beyond the Bizerte headland lies Cape Blanc. The day of our travel was poor weather. We drove around the Cape Blanc peninsular and failed to find a marker post or anything to indicate its significance. It was not very picturesque, the light was poor and very windy, so we decided to retreat to the town for a celebratory lunch. Sadly the town is not much to comment upon, other than in bad weather and during Ramadan it was a complete washout. So we retired back to Tunis for an excellent fish supper in La Goulette. 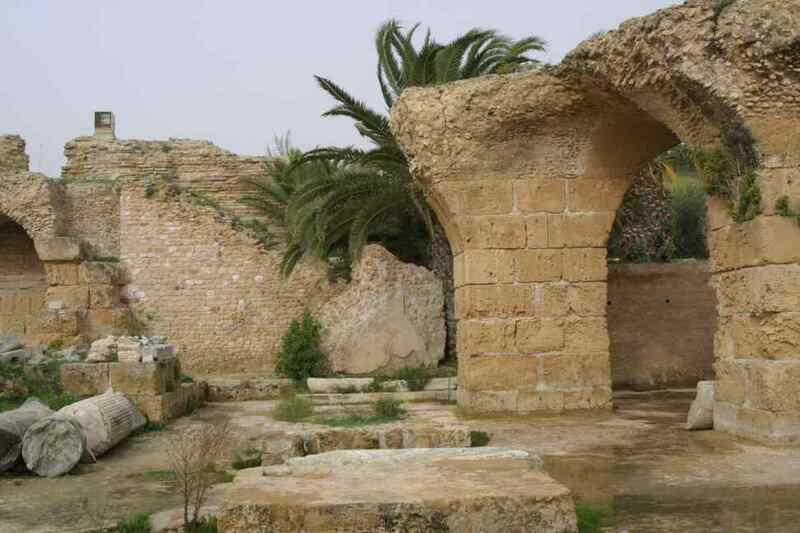 The ruins of Carthage are spread amongst the town, which is an extension of Tunis. This is the diplomatic area, indeed the Amilcar lies behind the Presidential Palace, and there are many diplomatic missions and official residences next to most sites. We went to a few, the most complete being the bathhouse. Parking is very safe, for there were a number of 'suited gentlemen' standing on street corners with covert wires in their ears and bulges under their armpits to guard your car! 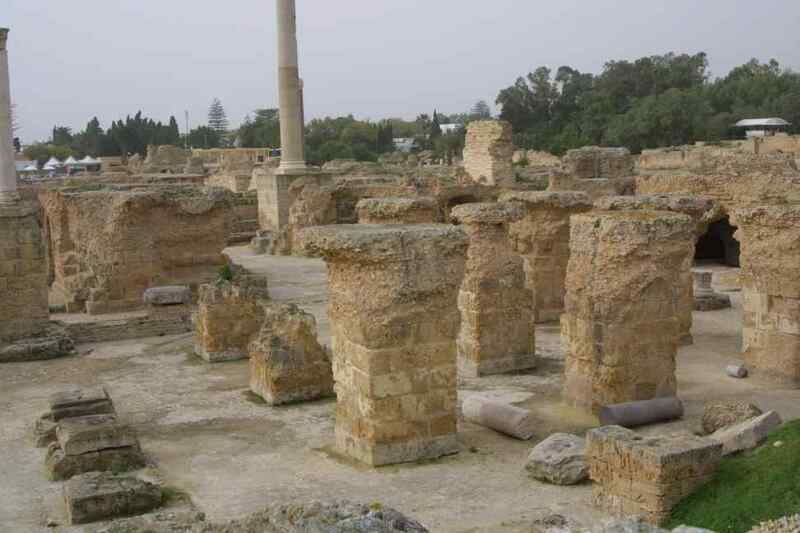 Carthage was founded around 814BC by Phoenician traders, the developing city grew around the Punic port area, until the Romans completely destroyed the city upon its capture around the 2nd century AD. Carthage became the third major city within the Roman Empire, with an estimated population of 700 000, but its demise at the hands of the Vandals and later the Arabs reduced Carthage to ruins, from which building materials was pillaged for their own mosques and Medina inland. Punic and Roman remains are widely scattered over the tow, but the largest is the bathhouse complex, which originally covered 9 acres and was believed to be one of the largest in the Empire. The Olympic sized pool was lavishly decorated with mosaics and statues. We attempted to visit Dougga, some 100km SW of Tunis, which has the most complete Roman and Phoenician remains. Built for mainly cultural rather than military or agricultural demands, the main focus is the Temple of Saturn. The Capitol has been well preserved and is still used today for modern classical theatre performances. Unfortunately we were caught in a Tunisian traffic jam, in which we struggled to find the correct road out of town. Events conspired against us when Daph decide to play up. The universal joints in her propeller shafts are worn after her sand exploits and there is a whizzing sound under the bonnet (a bearing on one of the pulleys on the serpentine belt may be seizing, perhaps). Added to which, during one of our crazy u-turns to get on the right road, we bumped over a central reservation and got stuck. Diff-lock shifted us easily, but we subsequently could not dis-engage the diff-lock. Unfortunately we never made Dougga - we'll have to save that for another visit. We spent our last night in the Medina and celebrated our finial African meal in the Del el-Jeld, a traditional Tunisian house that serves excellent food. Sitting within the main covered courtyard, the main dining area. The restaurant offers a glimpse into the past, for this former merchant's house has retained its original Ottoman style. One is allowed to wander around the main gallery rooms, retained for private functions and provide a wonderful view on the main diners below. The swift, yet unobtrusive service was slightly marred when on asking for the wine list (which we had been told was quite extensive) when we were reminded that it was Ramadan and were given complimentary water! Having squeezed the last drop of cheap Tunisian fuel into Daph, we headed for the port around 9am, in time for the midday sailing. By comparison with Friday the area was deserted, for around this time we were trying to find out where we could buy a ticket for Marseille and could not move for Genoa bound travellers. Now we were almost the first in the queue and waited almost 2 hours before we were moved through immigration and customs. With less than an hour before sailing we thought they must be quite efficient, but African administration had its last laugh, for the boat has delayed around 4 hours in docking, no one was told yet the administrative machine just ground on at it leisurely pace. It was just as well the boat was delayed, for it took over an hour to get the Carnet stamped. Most of the customs officers who looked at the carnets seemed to understand that it needed to be stamped, but no-one appeared to know by whom. Persistence was rewarded, however, and eventually one kind officer took pity on us and took us to 'Bureau 4', which was some way away from the queues of cars. An officer here confirmed that he would carry out the stamping, but first the document had to be signed, not by anyone, but by a 3 star captain!! After searching for some time, we found an important looking man in a uniform with 3 stars on his epaulette. He was presented with the carnet, which he duly signed, and then, finally, on reaching Bureau 4 again, the officer stamped the document to make our departure official. By now we were looking forward to a drink or two on board in the bar! The vast majority of travellers on this boat too were French desert travellers, most of whom were travelling in groups of half a dozen vehicles or more. Most of the men were wandering around the vehicles (which were predominantly Toyotas) discussing suspension bushes and extended fuel tanks!! Daph caused quite a stir, for she is more robust than most desert vehicles and carries extra equipment. Most interested parties could not believe the journey we had just completed. However the biggest attraction at this �impromptu 4x4 appreciation society� was generated by our friends Jacques and Chantal�s Land Rover. They were at the rear of the queue and came to find us. Apparently the Genoa boat was both over booked and a smaller vessel had been allocated. Due to this fact and the bad weather for that crossing, they wisely delayed their return trip a few days. Whilst talking to them, they had many people looking at their Land Rover, indeed opening their doors and poking their heads inside! We left them to their guided tours and got our table and chairs out for a picnic by Daph, for we had arranged to meet for an aperitif on the boat. Boarding was like the Le Mans start, but as the 4 lanes became one the loading was efficiently handled. Daph was one of the few vehicles with a bull-bar (not required in the desert), but this extra was well respected in queues! That said, despite being almost first in the queue, loading began elsewhere, not that it mattered for the boat was only half full. The ticket allocates a spacious cabin, within which we enjoyed a full 12 hours sleep on a reasonably smooth crossing. There are a few bars and restaurants onboard and we whiled a few hours away over a very pleasant dinner. The reason for the 4 hour delay in the arrival of the boat was that only 3 of their 4 engines was working (all very reassuring!) but they managed to claw back an hour on their return to Marseille. Considering France views itself as being on the edge of the EU and combating the illegal immigrants flooding into Europe, few, if any of the 4x4 vehicles were searched. Equally at immigration a cursory search of passports and wave through customs is not comforting (although very French!). We had to stop at customs for our Carnet stamp, which caused a commotion (stopping at customs � what ever next!). Despite the customs officer recognising the carnet immediately, which encouraged us, subsequently when we were asked to explain the document some 20 minutes later we felt as though we could have been back in middle Africa. The Michelin 954 1:1 million was accurate and sufficient. The 'Africa on a Shoestring' town map of Tunis was equally accurate and got us through Tunis, as did the maps within the Globetrotter country guidebook, which had a map of Carthage with the Hotel Amilcar marked. That said we had quite a drama on our last day in getting to Dougga - going north or south was very easy and clearly signposted, but crossing town was a nightmare - perhaps we were unlucky. Tunisia promises much and is very western. But once the surface is scratched, one sinks back into the African mentality. It was Ramadan, and most Muslim countries endure a slowdown and cease to function effectively after 2pm. Also it was the low season for tourists (less the desert travellers who seek the cooler months for their exploits) and therefore was not as geared for visitors as it might be.